You can enter our individual series races for just $2.00. (Students get FREE entry.) Just fill out the Weekly Waiver to give, along with your $2.00, to race staff on Saturday morning before the race. 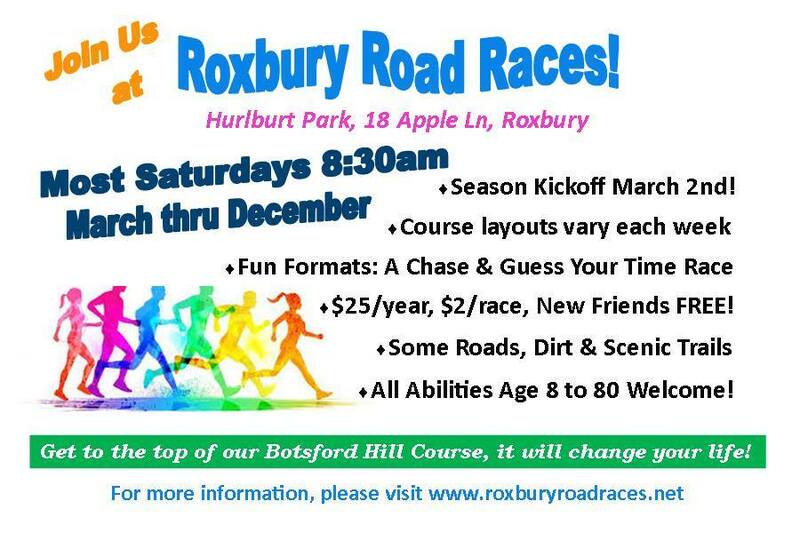 If you sign up as a member of the Roxbury Road Races Club for $25.00 for the year, that pays for your entry in all series races, not including the half marathon and marathon. And you just fill out the Season Membership form and you don't have to fill out the Weekly Waivers any more for the rest of the season. The 2018 season will begin on March 3! We have changed our fee schedule! - annual membership will be reduced to $25 (from $50 last year). and will also fund our charitable giving, which is an important part of our mission. - Weekly race fees will be reduced to $2 (from $5). - ALL STUDENTS RACE FOR FREE. fund, to the extent we can, especially when members donate above the $25 minimum fee. opt to pay on a weekly basis, then you have to fill out a waiver form every week. - Please print and fill out the membership form in advance of the first race. - Make checks payable to Roxbury Road Races Club. and finish at the Booth Free School on South Street (runners can jog or walk back to the park). There is no Roxbury Road Race Series race on July 28.
and registration for them is done via the web site.